The Club offers a wide range of facilities to suit most tastes. 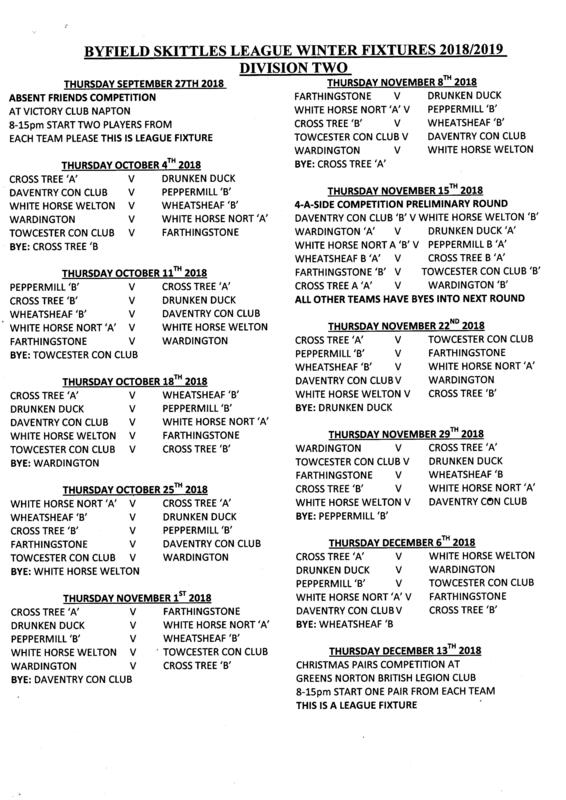 Below is a list of the pub games, fixtures & entertainment, including other key facilities we provide for our members and guests. The Club has an air-conditioned snooker room with three extremely well maintained tables. The Club boasts two teams in the Rugby & District League Division 1. Fixtures normally take place on a Monday night or an occasional Tuesday. Any members and their guests can play any time during opening hours. The rates to play are very reasonable. Teams contacts at the Club is Colin Skinner (‘A’ Team) and John Thorn (‘B’ Team). 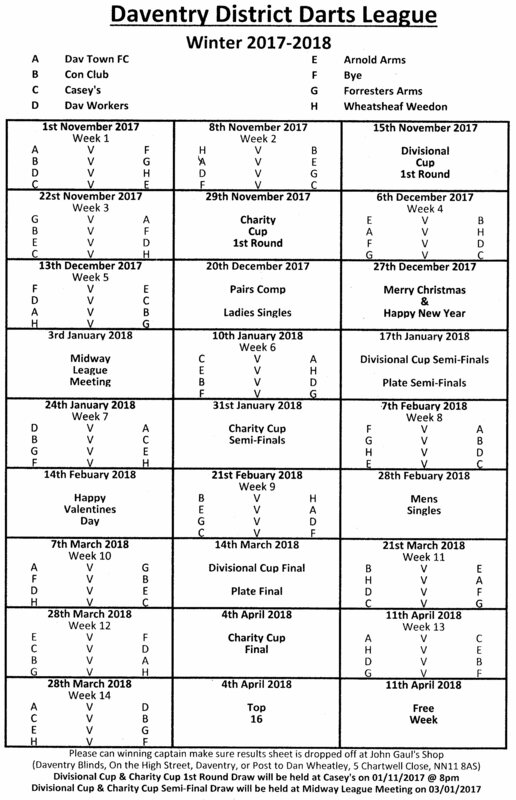 Rugby & District Snooker League fixtures can be loaded from here. The Club has a well-appointed dart board, set up on a stage and is well lit to meet the league standards. 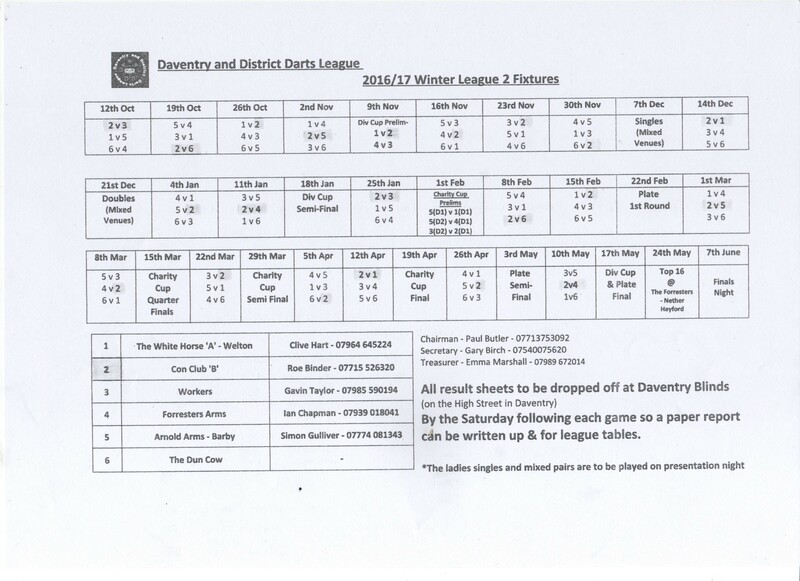 The Club currently has one team in the Daventry Darts League and one team in the Summer League. Matches usually take place on Wednesday Evenings. Any members and their guests can play for free when the board is not being used for matches. Teams contact is Ivan Lester. A second practice dart board is available in the upstairs games room for cup competitions, etc. 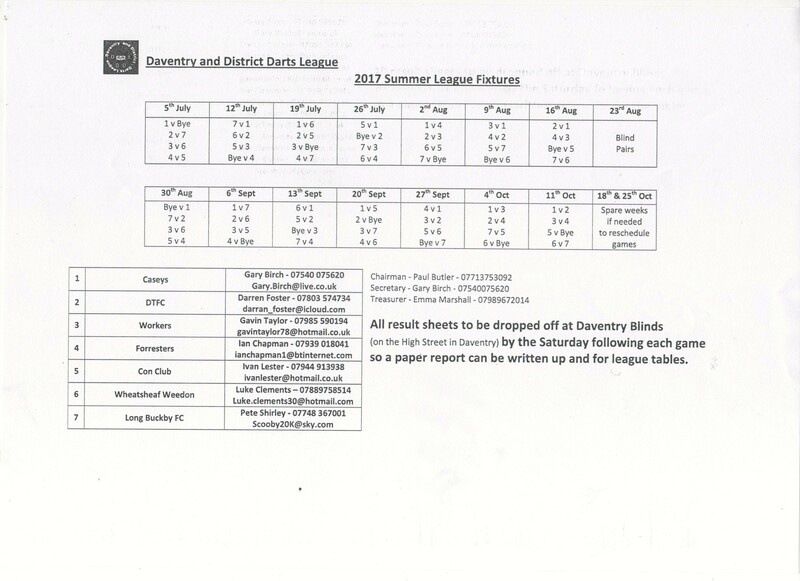 Daventry & District Darts League fixtures for the Summer League 2018 is shown below. The Club have a Northamptonshire Cheese Skittles table, which has been renovated to league standard. It is situated in the Games room on the first floor. 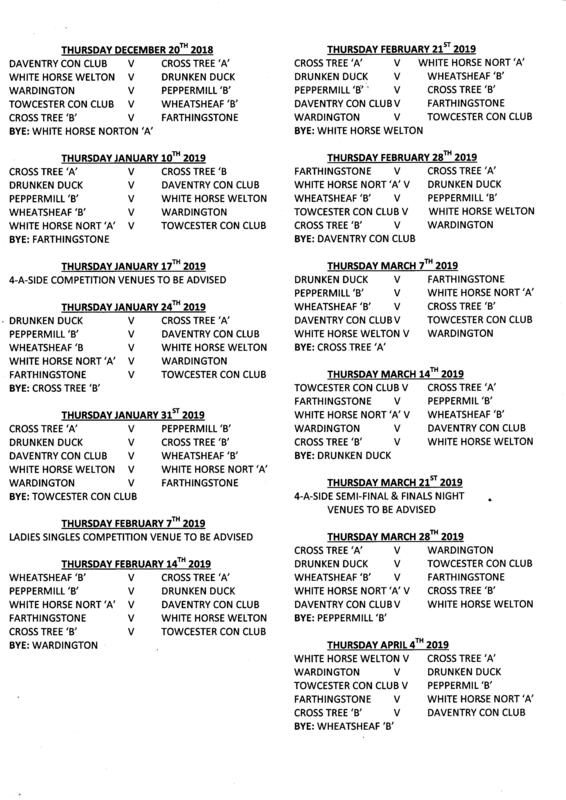 We have one team in the Byfield Winter Skittles League and also run a team in the Daventry & District Summer League. If you are interested in playing then please let us have your names and availability. 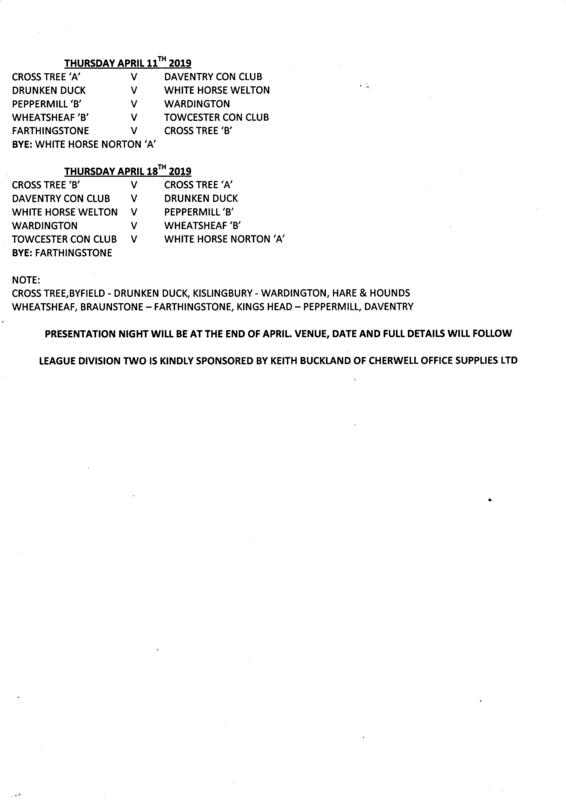 Team contact at the Club for the Byfield Skittles League is Phil Macefield and also for the Daventry Summer League. 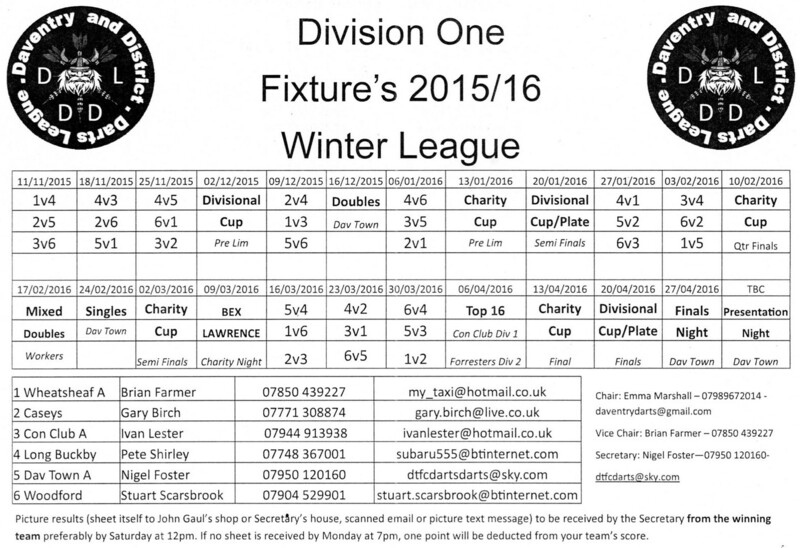 Team fixtures for both leagues are made available here when relevant for both Summer and Winter leagues. Team Captains for Winter league 2017 is Andy Houghton & Phil Macefield. Team Captain for Summer League is Andy Houghton. Dominoes is a popular game in the Club and is played in the bar area on several days of the week. Cards are also played in the Club, often on Friday nights. Live sports including – football, rugby, cricket, motor racing and tennis as well as other national events are shown on a 55″ widescreen TV providing these programs are broadcast on either national or freeview stations. Two small TV’s are available in different areas of the Club as well for special events whenever needed. On the last Saturday of most months you will find live entertainment in the Club from 9:00PM onwards. This takes place on the stage at the far end of the bar. As well as featuring popular local acts a variety of different artists from far and wide have performed at the Club. The acts which may be solo artists, duos or groups cover a variety of music styles from 50’s to current day. There is a small dance area available for the more energetic members. Live entertainment can be viewed around the Club by static camera and small monitor TV’s. A Fishing Section was set up in April 2010 and currently has 15 to 20 members. Regular fishing meetings are arranged at mostly local venues. Some trips further afield may be planned in the future. If you are a member of the Club and are interested in joining this section, then Paul Hale, Frank Smith and Paul Hart, are your key contacts. There is a thriving golfing section that occasionally get together to play in inter-Conservative Club tournaments. If you are a golfer, as well as a member, and are interested in joining this group, then David Darby, Club Secretary, is your contact at the Club. 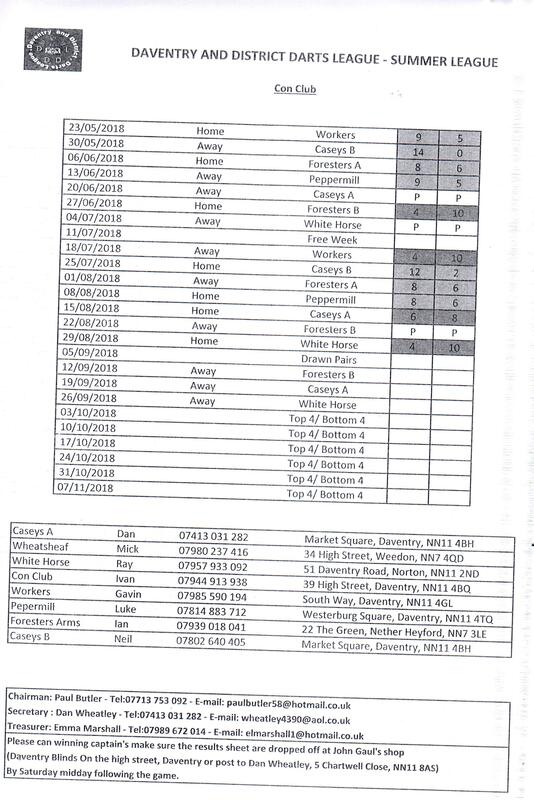 The Daventry Chess Club runs three teams from the Club. They are the first regular group to the newly refurbished Function Room. They play all their home matches on Wednesday evenings. Your contact for this group is Abbie Stevens.